Bourbon Street after the Saints first Superbowl win!!! With football season less than a week away I thought I’d post the article I wrote as a guest blogger for The Examiner’s Leon Logothetis about the New Orleans Saints Super Bowl win. Enjoy!!! As a native New Orleanian, I’m used to the glorious chaos that is the French Quarter. The crowds donned in feather boas and sipping daiquiris are a familiar site and one I never get tired of. 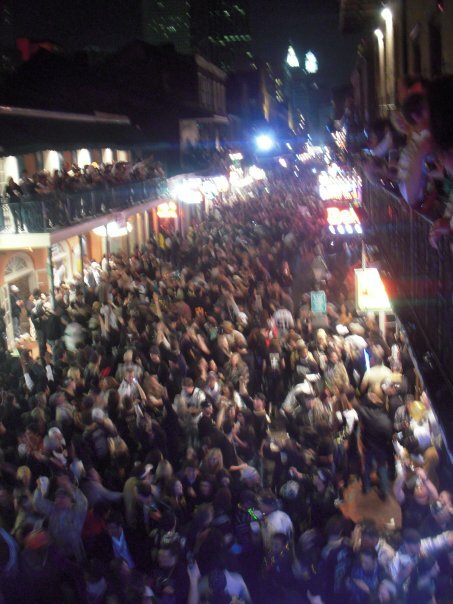 Everyone who goes to New Orleans for a good time usually ends up at the same place, Bourbon Street. This popular stretch of road is a force to be reckoned with on any day, but this past weekend was unlike any other I’ve ever experienced. Aside from Mardi Gras being in full swing, the entire city was abuzz over Super Bowl weekend. Until now, the Saints have been only one of five teams that have never made it to the Super Bowl. But now that has changed and hundreds of people took to the streets to celebrate. Black and Gold dominated the atmosphere and random “who dat’s” were shouted to anyone who would listen. Saints fans are famous for their passion and Sunday was no exception. People packed into the bars and clubs on Bourbon and cheered as if life depended on it. When it was all said and done the Saints had won their first bowl and history and I watched from a balcony as thousands of people flooded Bourbon Street in celebration. It was a once in a lifetime experience and one I will not soon forget. As I walked back to my friend’s apartment I was being hugged, kissed, and high fived by random strangers and enjoying every minute of it. This is a happy day for the city of New Orleans and a well-deserved victory for our team. As I prepare to pull out a very uncomfortable sofa bed and get some much needed rest I’m reminded of this historic night by car horns honking and people shouting “Go Saints” and I have a feeling it’s going to be like this for awhile.